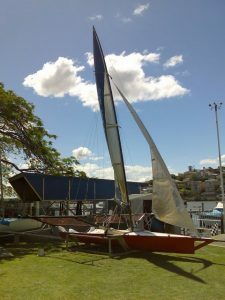 We had an interesting introduction to sailing an 18 foot skiff during the second race of the Moreton Bay Championships. The race was sailed over the old 18 footers course on Waterloo Bay. Mark 1 was between Green Island and St Helena Island. Mark 2 close to the Huybers Beacon and the start line and Mark 3 south of the end lateral becon’s into Manly Boat Harbour. We started the race in 3 – 5 knots of wind from the NE with the small rig on the boat. We sailed well on the beat to the first mark and also on the two sail reach to Mark 2. Then came the time for our first kite set. The guys made a great set and we started our first kite run. This was the point when we realised how much power these boats have. With the breeze around 5 to 8 knots we sailed downwind sitting on a constant 10 knots with two on the wire. After a couple of gybes we managed to pull off a very rushed gybe drop right on the mark. The driving was very ugly at this point but For’ard hand, Mark Graveson and mainsheet hand, Simon Hunter did a fantastic job and didn’t even get the kite wet. For the next leg to Mark 1 the wind was around 10 knots with gusts touching 12. Two on the wire and Simon moving onto the wing in the gusts. This leg showcased some more dodgy helming in the tack at the top mark. Most people would tack a bit slower in 12 knots than they did in 5 knots, but who said skippers were smart. The result, one very annoying swim right next to the rescue boat. After righting the skiff we set the kite for the 1 leg run to the finish. With the breeze pushing 12 knots constantly we held three on the wire all the way down this leg. That was until 100m from the finish. A little lull in the breeze was enough for us to unbalance the boat and pull it in ontop of ourselves. This swim cost us a lot of time as the mainsheet decided to wrap itself around the tiller while we were on our side, resulting in us sailing the wrong way for a while trying to sort out the mess. We did end up finishing the race after all this although a bit late. We now know allot more about how the boat sails and what it needs to make it go fast. We still have a bit of work to do to be able to race the boat at full tilt but we are confident that we can get there. Hopefully by the time the world championships come around. Our next race is the first heat of the Brisbane River Championship, sailed out of Bulimba on the 5th of January. Our next report will be up soon after that race.